Frida Kahlo’s powerful autobiographical paintings have made her one of the most recognisable faces in history. In Mexico, where Kahlo is a national idol, the artist is known as asla heroína del dolor, ‘the heroine of pain’. Her images are suffused with physical and existential torment, born out of a life marked by injury, obsessive love and loss. Their stark honesty presented an entirely new approach in the expression of female experience. The daughter of an immigrant German photographer and a Mexican mother, Kahlo played with notions of identity throughout her life. Though born on 6 July 1907, Kahlo later claimed her birth date was 7 July 1910, the start of the Mexican Revolution. This era of profound upheaval allowed Kahlo to break with social conventions and pursue a life that eventually transformed her into a feminist icon. In 1922, Kahlo was enrolled at the National Preparatory School, where she was one of only 35 girls in a student body of 2,000. She planned to study medicine but a near fatal bus crash in 1925 altered the course of her life forever. Bedridden with multiple broken bones and a pierced abdomen, Kahlo took up painting, using herself as her primary subject. Two years after the accident she approached Diego Rivera, by then a famous exponent of the Mexican Muralist movement, to seek his opinion of her art. Rivera admired her talent and was enamoured with the feisty, much younger Kahlo. The pair married in 1929. Kahlo later stated, ‘I have suffered two grave accidents in my life, one in which a streetcar knocked me down… The other accident is Diego’. Kahlo’s tempestuous relationship with Rivera is encoded in much of her art, as are the health complications that continued to plague her. She was particularly traumatised by her inability to bear children, though she conceived three times. Kahlo’s art was often categorised as Surrealist because of her sometimes bizarre iconography. In the late 1930s, the Surrealist founder André Breton helped her to exhibit in New York and in Paris, where her painting The Frame became the first work of a twentieth-century Mexican artist to be purchased by the Louvre. But unlike the Surrealists, Kahlo was not interested in dreams, the subconscious or the uncanny, and instead asserted that she painted her reality. Her deeply personal work found its wellspring in her colourful life and was largely influenced by Mexican retablos (votive paintings). 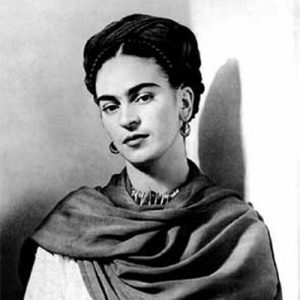 Kahlo died in Mexico City in 1954, aged 47, a year after her right leg was amputated to stop the spread of gangrene. While she was a celebrity during her lifetime, it was not until decades later that her art truly gained international exposure. A best-selling biography published in 1983, two biopic films and several theatrical productions have since introduced Kahlo’s captivating story to broad new audiences, and her image can even be found on Mexico’s national currency.